The Jefferson Memorial in Washington, DC is a dome-shaped rotunda that honors our third president, Thomas Jefferson. A 19-foot bronze statue of Jefferson is surrounded by passages from the Declaration of Independence and Jefferson’s other writings. The Jefferson Memorial is one of the most popular attractions in the nation's capital and is located on the Tidal Basin, surrounded by a grove of trees making it especially beautiful during Cherry Blossom season in the spring. From the top steps of the memorial, you can see one of the best views of the White House. During the warmer months of the year, you may rent a paddle boat to really enjoy the scenery. Parking is very limited in this area of Washington, DC. There are 320 free parking spaces nearby at East Potomac Park/Hains Point. The best way to get to the Memorial is on foot or by taking a tour. For information about parking, see also Parking Near the National Mall. Open 24 hours a day, Rangers are on duty from daily and provide interpretive programs every hour on the hour. The Thomas Jefferson Memorial bookstore is open daily. Take your time and marvel over the inspiring inscriptions and remarkable architectural details. Participate in a ranger program to learn about Thomas Jefferson and his impact on the history of our nation. 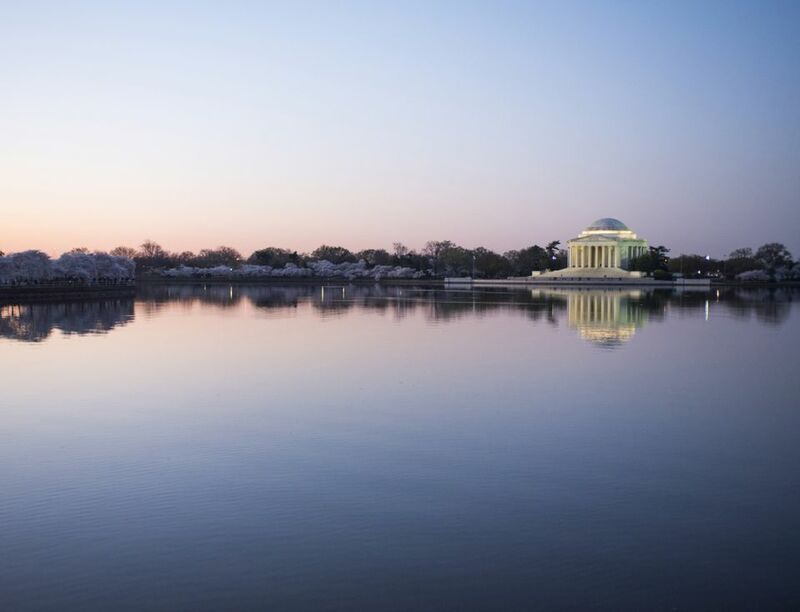 Sit on the steps of the Memorial and enjoy the panoramic views looking across the Tidal Basin. Be sure to step inside the Memorial and check out the historic exhibits and the bookstore. There are public restrooms available in the lower level. Visit early in the morning or after dark when the Memorial is less crowded. At night, the impressive structure is beautiful when it is illuminated. A commission was created to build a memorial to Thomas Jefferson in 1934 and its location on the Tidal Basin was selected in 1937. The neoclassical building was designed by architect John Russell Pope, who was also the architect of the National Archives Building and original building of the National Gallery of Art. On November 15, 1939, a ceremony was held in which President Franklin D. Roosevelt laid the cornerstone of the Memorial. It was intended to represent the Age of Enlightenment and Jefferson as a philosopher and statesman. The Jefferson Memorial was officially dedicated by President Roosevelt on April 13, 1943, the 200th anniversary of Jefferson's birthday. The 19-foot statue of Thomas Jefferson was added to the memorial in 1947 and was sculpted by Rudolph Evans. Thomas Jefferson was the third President of the United States and the main writer of the Declaration of Independence. He was also a member of the Continental Congress, Governor of the Commonwealth of Virginia, the first U.S. Secretary of State, the second Vice President of the United States and the founder of the University of Virginia at Charlottesville, Virginia. Thomas Jefferson was one of the most important Founding Fathers of the United States and the Memorial in Washington DC is one of the most visited attractions in the nation's capital.